WhenToWork can be set up to automatically notify employees when there is a new published schedule or when their published schedule has changed. When adding an email for an employee, the notifications are defaulted to ‘None’. Each employee has a Notifications page where they can enter their own emails and text message addresses and choose which events trigger an email sent to each address. (Managers with permission to edit employees can also view and set up these notifications for employees from the Employee details page or on the Notifications Grid). You can stop automatic notifications from being sent out at all when Publishing & Unpublishing by changing that global option on your SETTINGS>Info page. This option can be turned On and Off at any time and the change goes into effect immediately. 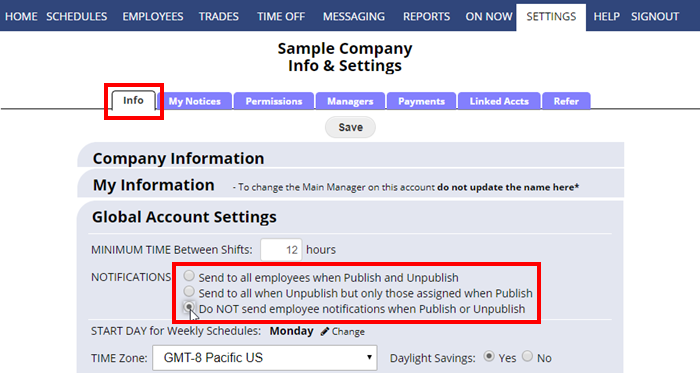 When changing a shift on a published schedule, you can check or uncheck the box for sending notifications to affected employees. A useful Schedule View when making multiple changes to a published schedule is the Multi-Shift Edit Schedule View which allows you to change a number of shifts, set whether or not to send notifications, and then Save Changes all at once. Note: these check boxes default On or Off according to your SETTINGS>Info page Publish/Unpublish notification option choice. W2W messages can be viewed when users sign in to WhenToWork.com. Messages can be forwarded to the user email if their email address is entered into the system, and they choose that option on their Notifications page. (Separate notification options can be set up for each email and text message address entered). On the Statistics and By Employee schedule views, you can see the status of whether employees have been emailed the schedule, confirmed receipt of email, or has signed in and viewed the schedule.